Location: 160 km / 99 mi. northeast of Manaus on Rio (river) Preto da Eva, a tributary of the Amazon where the waters due to its high pH factor inhibit the proliferation of mosquitoes. Transfer takes an average of 3 hrs in two 80 km stages: the first leaving Manaus to the city of Rio Preto da Eva and another 80 (1:30 hr) on canoe to the lodge, deep inside the jungle. The Lodge: a maloca with 12 double rooms with private bathroom, 1 honeymoon suite in a private maloca, restaurant, lounge, bar and reception area and meeting point. Package includes: breakfast, lunch and dinner as specified in program, fresh tropical fruits, mineral water, indian and bilingual guide. 14h00 – Canoe expedition passing by igarapés (forest channels) and visit to neighbors – the caboclos that live in the forest and have an indian heritage. On the way back, fishing piranhas and after dark, go flashlight hunting for caymans. 8h00 – Jungle trek. Guide will explain how to use the plants including those with medicinal properties. On the way, stop for a swim in one of the many waterfalls of the area. 20h00 – Sitting around the the campfire and experience the night sounds of the forest and multitude of stars above. 14h00 – Canoe survival expedition learning to live like the Indians. Use of the forest produce like roots and medicinal plants, jungle trek building a shelter for the night and a campfire for cooking. Sleeping in hammocks, as South American indians have done for centuries. Moving and set-up a new camping ground for the evening. Explore the surrounding untouched forest. Overnight in hammocks. A day similar to day 2 setting up camp for another night in the forest. Overnight in hammocks. Moving from one place to the other is the best way of seeing how different different spots of the forest are. 20h00 – Sitting around the campfire and experience the night sounds of the forest and multitude of stars above. Optional canoe survival expedition learning to live like the Indians. Use of the forest produce like roots and medicinal plants, jungle trek building a shelter for the night and a campfire for cooking. Sleeping in hammocks, as South American indians have done for centuries. 14h00 – Paddle canoes through igarapés (channels) and igapós (flooded forest). Swimming in the river. 8h00 – Leave on a longer jungle trek when the guide will explain the use of the plants and fruits. Visit to the neighbors and their “Casa da Farinha” / Manioc House where it is prepared the staple food – manioc or cassava root flour. 20h00 – Sitting around the campfire enjoying the forest and its sounds. 8h00 – A jungle trek in a different direction visiting another ecosystem ending at a waterfall for a swim. 14h00 – An optional jungle survival training when the guide will show what the indians use for medicines. Setting up camp for the night building a shelter, a fire and sleeping in hammocks like Latin American indians have done for centuries. 14h00 – An afternoon of leisure activities, fishing, paddling, walking around, etc. 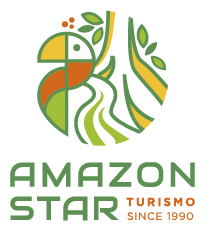 This package includes: Round trip transfers, 5 days / 5 nights at the Malocas Jungle Lodge, 2 days / 1 night on board a regional boat, all meals and expeditions, English speaking guide, mineral water. Gratuities and other beverages not included. Imagine a place where there are 500 know species of fish and another 500 yet being catalogued! This is the Amazon ecosystem! Prize catches are the Tucunaré (Cichla ocillaris), commonly known as Peacock Bass, or the Matrinxã ( Brycon sp), both combative species.